Maybe this makes me a wimp, but I reeeeally can’t handle the heat when it comes to salsa. Medium is about as crazy as I get on the spiciness scale. So it comes as no surprise that I’m a big fan of salsas that incorporate fruity sweetness into the mix. Any mango salsa lovers out there? Oh yeah, me too! If only mangos weren’t so dang expensive and hard to peel/chop! Mangoes are definitely a “special occasion” fruit in my book. Peaches, on the other hand, I’m all about! (Assuming they are in season, of course.) I decided long ago that attempting to eat a peach purchased out-of-season is a sad, sad experience. One that I don’t care to repeat for the rest of my life. My favorite peaches ever are the ones the Washington Fruit Commission has sent me for the past two summers! They’re everything a peach should be, and more. And try as I might to eat as many fresh ones as possible, there’s comes a time when one realizes that one cannot exist on peaches alone, and that if one continues to eat peaches at every single meal, one might, in fact, BURST, or else turn INTO a peach. At which point it is best to learn how to PRESERVE, so that one can quit stuffing peaches into their face as though the apocalypse is coming. (Which is exactly how it feels when you have two dozen spectacular peaches that are inching closer to the point of spoiling.) If you have found yourself in similar predicaments in the past… I am here to teach you the beautiful art of preservation! It will open up a whole new world of possibilities to you! By the way, the peach of a woman you see above is my seester, who helped me get all this glorious fruit preserved before the apocalypse. By the way, last year I made Honey Vanilla Peach Jam with my Washington peaches, and it graced my morning toast for months to come! (I made some again this year too, but I accidentally gave a lot of it away. Drat! It was soooo divine while it lasted.) You should make some of that too! Along with the jam, I went a little wild and made Peach Salsa this year as well! And what can I say about it? It’s good. I like it. I like how it is salsa… but with peaches. I like how the peaches add fruitiness to the salsa. (Can you tell I would NOT win if I competed to the The Next Food Network Star?) 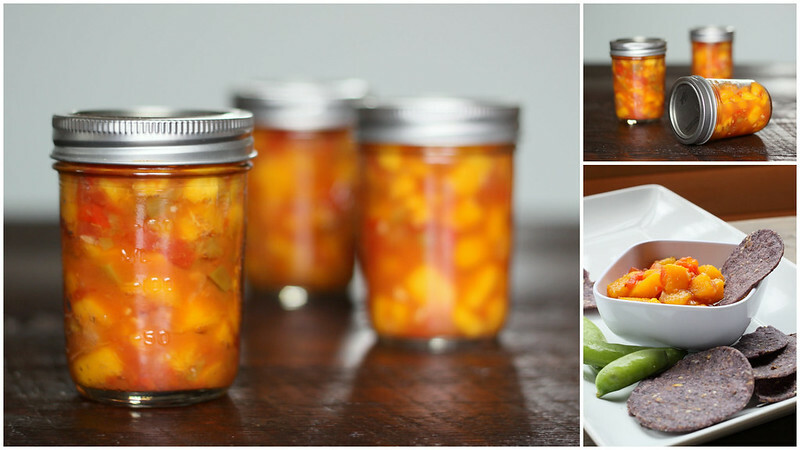 The point is: Peach Salsa is an awesome idea, a fun way to preserve summer peaches to eat year-round, and it’s easy! 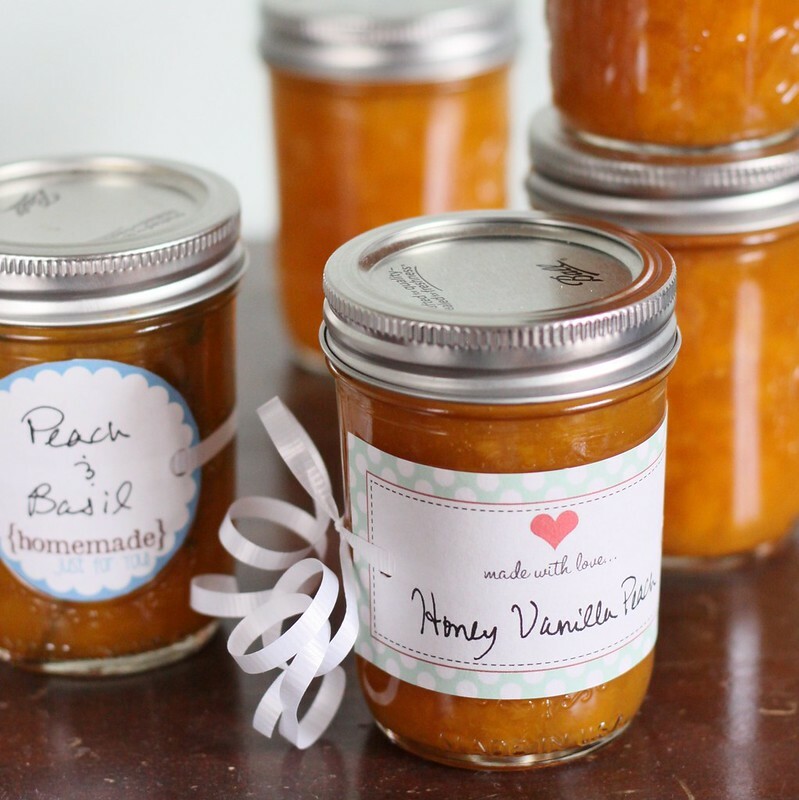 Lots of the ingredients you probably already have on hand… you just need good peaches! Word to the Wise- I think canning is a much easier and more enjoyable experience when you have the few basic tools I’ll list below. Once you procure them, you’ll use them for a lifetime. Totally worth the initial investment! Cute labels, also optional… but come on, they’re free! Here’s the printable recipe for the salsa below. If you’re a visual leaner and are curious to see step-by-step photos of the water bath process, you can check out my Peach Jam tutorial. The steps are exactly the same… just a different list of ingredients. Enjoy! 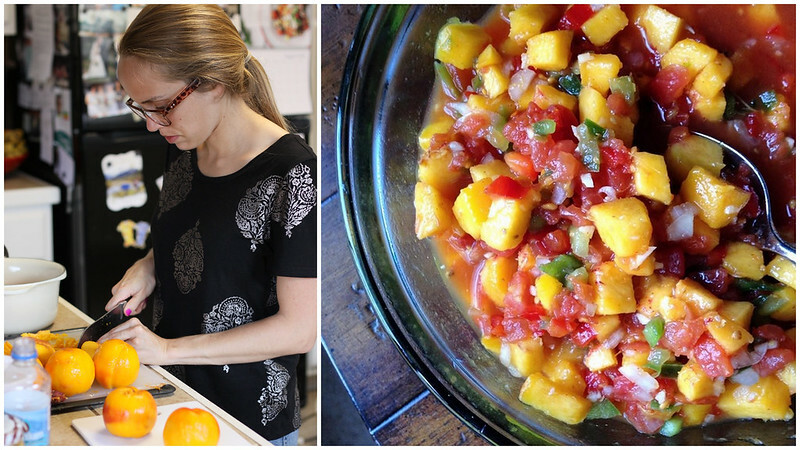 The perfect combination of spicy tomato salsa and sweet, summer peaches! To peel peaches, blanch them in a pot of boiling water for about 30 seconds each. Remove from water and use your fingers to easily pull away the peels. Then place peeled peaches into a large bowl of water along with the 2 Tbsp apple cider vinegar while peeling remaining fruit. While jars and lids are simmering, chop peaches, tomatoes, peppers, and onions (as finely as you prefer.) Stir all ingredients (except the tomatoes together), and heat in a saucepan over Med/High heat until boiling. Boil for 3 minutes, then stir in the tomatoes and boil 2 minutes more. Then remove saucepan from heat. Carefully lift a warm jar from the simmering water, pouring water out of the jar as you lift. Ladle salsa into the sterilized jar, leaving about ¼ inch of head space at the top. Wipe around the rim of the jar to clean off any salsa that has spilled over the sides. Repeat this process with all remaining jars. If you end up with extra salsa, you can always store it in the refrigerator to be eaten in the next few months. Return filled/lidded jars to the pot of water and make sure they are fully submerged by a few inches. Bring water to a rolling boil, place a lid on the pot, and process jars in boiling water bath for 10-12 minutes. When 10-12 minutes are up, remove the lid from the pot and turn off the heat, but allow jars to sit undisturbed in the water for 5 minutes so that the pressure inside can equalize. Then screw on the lid bands as tightly as you like, wipe any hard water residue from the jars, label (if desired), and enjoy!